Whether you’re building a new house or looking to freshen up your existing property, your driveway should be at the forefront of your planning. The driveway is often undersold as an important element of a property. People tend to see it as simply the thing that gets you from the road to your garage. But in reality, it can often be the first visual cue that people pick up on when forming an opinion of your house. A driveway that is cracked, missing tiles or is covered in dirt and oil stains doesn’t give the best first impression—an ugly driveway can very quickly detract from all the beautiful features of your home. A concrete driveway is often the best option when it comes to choosing the best possible type of driveway. Nothing is as durable or as easy to maintain as concrete. If you opt for a paved or tiled driveway, then you can expect to spend most Saturdays pulling up weeds from in between the pavers, replacing chipped tiles or re-grouting the entire driveway after a heavy bout of rain. You could choose an expensive slate option, but what happens when your car has an oil leak? You might have to tear up the whole thing, just to replace that one, stained section. Luckily, you won’t have any of these problems with a concrete driveway. And, with so many ideas, options, and variations, you can create just about any look you want. A plain concrete driveway could be the answer, if all you’re after is a neat and easy-to-maintain entry point to your home. A plain concrete driveway only needs a hose down every now and then to keep it looking brand new. And, as long as you get it poured by an expert contractor like Everlast Services, it should last a lifetime – no cracks and no hassles. An exposed aggregate driveway gives you all the durability and lack of maintenance associated with a plain concrete driveway. But, it has the added texture and finish that will give your house a dramatic entry point. The beauty of exposed aggregate is that its pebbled surface hides oil stains, is non-slip and will stand up under rain, hail, extreme heat and the daily crunch of your car. Best of all, it also means your driveway takes on a different look and feel from every vantage point. This aesthetic works with all types of house, from modern homes with rendered facades, to vintage weatherboards and classic red bricks. If you want a driveway that adds to the aesthetic of your home, exposed aggregate is the perfect choice. Painted concrete opens up endless possibilities for your driveway. If you want to create a neat driveway that snakes around your garden beds, then why not opt for a plain concrete driveway with a painted edge. You can even make it look like a brick-border by using a stencil. Use a terracotta tile stencil to turn your home into a Mediterranean showpiece. If you live by the coast or want to bring the beach to your doorstep, using sand-coloured concrete will make it look as though you house is sitting right on the beach. If you want to create a visual that will attract attention, go for red painted concrete or keep it rustic and earthy by going for a deep brown. You can even mix and match colours and create adventurous geometrical designs for your driveway. Whatever you’re trying to create, a driveway offers the flexibility and durability that other options can’t. The toughness of concrete is legendary and if entire buildings can be constructed from it, then you can definitely trust it not to crack under the weight of your car or a heat wave. However, to achieve this durability your driveway must be poured absolutely perfectly. Unless you have experience in concreting, pouring your own driveway is definitely not recommended. Instead, [sc:contact-us] get in touch with an expert contractor. When it comes to getting the perfect pour, you can’t go past the team at Everlast Services. With over 20 years in the business, there isn’t a concrete job they haven’t done or a problem they haven’t fixed. 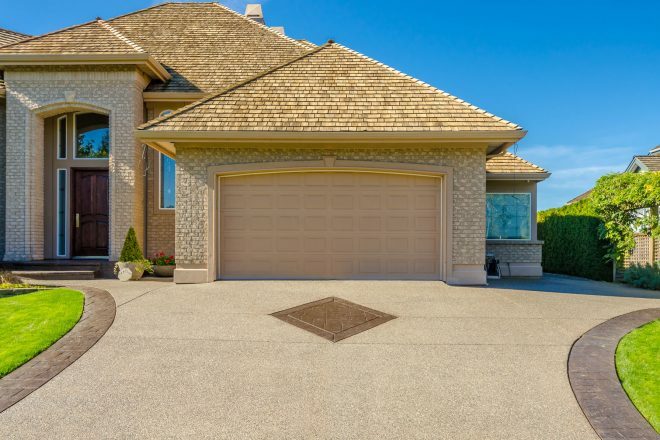 They can give you there expert opinion when it comes to selecting the perfect driveway option for your needs and you can trust their experience when it comes to leaving behind a finished product that will last for years. Contact Us for concrete driveways Melbourne.